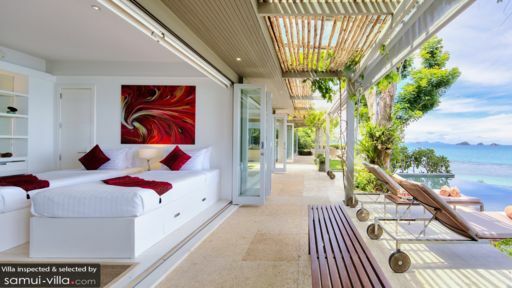 The Headland Villa 3 is a vacation complex which consists of two pavilions – both epitomizing contemporary tropical design. With a consistent white color scheme, interiors – fully utilizing compact space – are appointed with predominantly stylishly crafted in-vogue and luxurious furnishings and fixtures. Amenities are essentially of hotel and resort quality – to ensure each and every guest’s pure pleasure and indulgence. Standing on a headland elevated from Taling Ngam Beach, the Headland Villa 3 serves you swanky vacation living amidst tranquil surroundings. The villa has three air-conditioned bedrooms in a separate pavilion. One of these bedrooms has a queen-sized bed, and the other bedroom has twin beds. Both bedrooms also have dedicated bathrooms with rain showers. Both bedrooms also have direct access to the infinity pool. While the third bedroom is a mezzanine room with two single beds that can be converted to double bed. Aligned to the edge of the property’s exterior is the 10-meter infinity pool. Immerse yourself in its mesmerizing, crystal clear waters which appears to carry you out to sea. 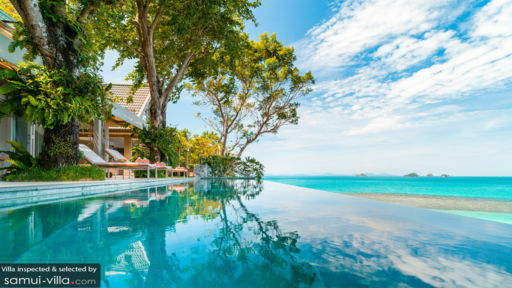 From the water, you can laze on wooden pool beds partially shaded by trees on the poolside lawn. At the villa’s sunny, breezy and high-ceilinged central pavilion is the living area. Around its hefty, angled sofas, you can all get together for some engaging conversation. Close to one of the sofas is the dining area with its timber wood table good for eight. Here, you can all indulge in authentic local cuisine – as well as international favorites – masterfully prepared by the onsite chef at the fully-equipped, modern kitchen at the back of this same pavilion. The kitchen also has a counter which, provided with high chairs, serves as a bar for meals, snacks, coffee and all kinds of drinks. The central pavilion also has a loft-type TV lounge where you can all anticipate the new episode of the latest blockbuster series. Or, relive the unforgettable scenes of your most beloved classic movie. On duty to deliver the everyday services of the villa is a friendly and helpful staff made up of mostly housekeepers and security personnel. Aside from the chef, a babysitter, a driver and a spa therapist may be called in upon your request. However, their services come with a separate charge. Car rental is also available. The Headland Villa 3 is based within the area of Taling Ngam Beach. Hop aboard a traditional, long-tail boat and explore the neighboring islands. On another excursion, go fresh water, leisure fishing at TopCats. Then go on a nature exposure tour of the colorful Butterfly Park And Insect Kingdom. Unlike typical villas in hotel chains, which are suites in the form of a small huts with full hotel amenities, the Headlands Villas are vacation homes with enough amenities for daily living. This place is ideal for a frequent traveller looking for a place to relax and have his/her own private space. I liked the fact the villa is strategically located away from the touristy areas, close enough to the airport (45 minutes by car), and accessible to the neighboring Intercontinental Hotel. I felt pretty safe there. The beach is of a nice size for the population in the area and secluded enough. Oliver + Lek and her team (Aoi the housekeeper, the driver, and the garden boy) make your vacation hassle free. Lek in particular is very on top of things. Service is unobtrusive and efficient. Breakfast is a good spread - add eggs at a very reasonable price for a full American breakfast. After trying out an eatery, we decided to have all our meals cooked in the house as Chef Pik was pretty good and the prices reasonable. The masseuse Lek recommended was amazing!!! The premises is as pretty as advertised. There's minor wear and tear vs. the catalogue photos, but once you look past that you will feel like part of the open space just lying in bed, sitting in the living room with a book or chilling in the infinity pool.... so much so I didn't feel like getting out of the place. Some things to be mindful of: this IS the tropics and there will be mosquitoes. Lek and team has put mosquito coils all around the room - no mozzie issues in my bedroom - but it makes sense to close the windows at dusk and when it rains. The mezzanine room has only outdoor staircase access within the premises. We decided to make that our TV and massage room. The place does get humid as it is right next to the sea, cooler air conditioning is advisable. Some drawers and closets might need a fresh coat of paint. We visited the villa at the tail end of the rainy season, which was a bummer if you had a typical beach vacation in mind....fortunately the open concept design works nicely as you do not feel confined at all. The villa is at a vantage point above sea level - seascapes were breath taking and very unique to this place. I share some less typical views seen from the garden. I am so glad to find this place via this website. Good job folks, I look forward to the next stay here!!! We were a party of 7 in total. Before the trip started, I was planning and organizing the trip for everyone. 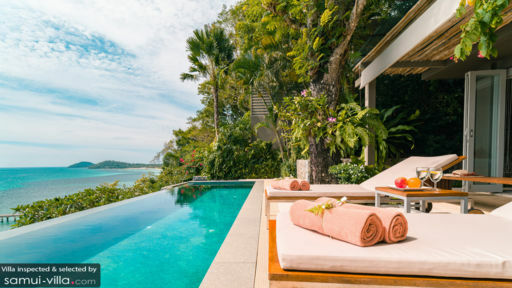 At first I was questioning myself if the price will worth the try to this Villa, but once you read through my review below, it is worth every single penny! By being so confused with the planning, I have gotten contact with Mr Dean Cooper from Headland. He introduced me with many excitements and ideas on how should we spend this holiday. Dean was such a great help and great follow up even after our trip!! Extremely well service! We are together with 3 couples and 1 photographer for a wedding shoot and a relaxing trip from the city. The team in Villa 3 assisted to made all beds to be king size so we can all sleep in pairs. The sofa for the photographer was also well prepared. The view from the Villa 3 was magnificent!! Especially for Sunset, everyday was an unforgettable scene! Each day the room was prepared with a small leaf and hand picked flower to decorate. At first I though it was just randomly picked and placed. But one day I headed back to the Villa a bit early and saw Doi (housekeeper) was using scissors and carefully designing what she will be putting on our bed, it was so thoughtful and sweet! Khun Lek - the villa manager was on top of everything from breakfast to dinner, she directed me to great restaurants, view spots, massages, and even assisted with the cooking!! Khun Lek and Doi's smile will never be erased from my memories since they were so bright and cheerful everyday when we met!! Since this is just gonna be a beach and sea trip, we didn't bring anything expensive, so we decided to just leave EVERYTHING open and just take our cash and passport with us while we travel. You will need to experience it to feel it, we felt so safe that after a few days, camera, wallet and everything left in the Villa and it was well managed. No where in this world can make me this safe other than my home. Yes, Headland is now my second home!!! If anyone is planning to go Koh Samui, don't treat it as if you will need an activity everyday. You can just sit at the Villa, the joy will still come in! We have booked a chef to cook for us in the Villa. The price was unbeatable! You can never ever experience such great cooking and the variety of 3 appetizers, 2 soup, 2 main course, 1 rice, 1 noodle, 2 dessert. Remember, it is for 7 person. it came around to be HK$150 per pax, with a personal chef!! And the taste, it tasted so good, I don't think, i can ever find this taste in Hong Kong or New York. Not just "worth a try - good", it is a must to have the chef to come cook!!! The breakfast provided was a continental breakfast but they were so kind to assist us with other cooking as well!! The breakfast is a must to have, you just gotta wake up for it, it really cheers you up for the day~ Thanks to you Doi, your cooking was wonderful! Now when it comes to cleanliness and tidiness, everything was well managed, the gardener did a magnificent job to clean the pool and garden EVERY MORNING! I really have no complains to this Villa, everything was tip top, I really enjoyed it!!!! Khun Lek and Doi is such a great asset to Headland, their service, smile, and efficiency made our trip the most memorable! We stayed 10 days at Headland 3-we were extended family of 6 + 2 babies-the set up and space were both great. Best thing about the villa is the view and the staff-managed by Lek the entire staff went out of their way to make our stay as good as possible. Fresh fruit was cut up every morning and takeaways collected and served for us. Lek, was absolutely fantastic, nothing was too much trouble. On a couple of evenings we had a chef come in and cook for us which I would highly recommend. Otherwise, the kitchen is very well equipped and the staff provide a BBQ too. If you stay at Headland villa I would highly recommend hiring a car as it means you can get out and about around the island really easily. I will definitely be returning. Thanks all! We have spent 2 weeks in Villa 3. We were 4 adults and 4 children between 1 & 7 years old. It is a great location with incredible view on the sea. Swimming pool is perfect not only for aduts but as well for children. House is big and well equiped. Service is excellent and always keen to help you and make your holidays pleasant. We really recommend this location and already look for going back there. We've been going to Thailand for 15yrs but I've never, ever found somewhere as stunning as this. It's on the virgin coast. Pristine. Right on the beach, but elevated giving incredible 270 degree views. We'd often watch the sunset from the infinity pool with a glass of wine. There are 3 bedrooms, all with beautiful ensuites. But one of the rooms has a loft with another 2 beds, so we could easily have fit 2 or 3 families, or brought along some grandparents. My favorite time of day was breakfast. The staff would prepare eggs, bacon, toast, fresh tropical fruit, yoghurt, croissants, juices, cereal & delicious coffee. Them they'd vanish leaving us to eat looking out over the ocean. Some days the amazing staff would bring hot chocolate croissants, fresh from the French bakery. They even gave the kids some toys for the pool. Yet they seemed to keep the balance of giving us privacy most of the time. There was plenty to do on the days we chose to head out. We loved going to the Thai boxing for some exercise at the end of the street, & paddle boarding. But most fun was had just jumping off the pier. Lots of dirt cheap restaurants on the beach nearby. Amazing food. If you're there on a Saturday do walk along the beach at 8pm to see the fire show. What an experience. Wifi was excellent which kept hubby happy. Someone has gone to a lot of effort to get the little details right at Villa 3. I can't wait to be back.